Drum! Cloick! Clack! 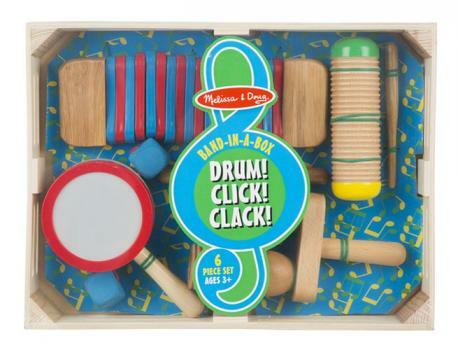 Ages 3+ will be delighted by this six piece percussion set. It includes a spin drum (hand held monkey drum), a Kokirko ( clacker) , an agogo with mallet (a hand held double tone block set with beater) and a Guiro with Mallet. All this comes in its wooden crate that measures 14.59" x10.50" x 3.50". Greeat for storage. Be sure to see the other Melissa and Doug sets, Chime! Whistle! Jingle! and Hum! Jangle! Shake! They're all available in our Kid's Korner.